One of the first recipes I made was this beautifully baked Sea Bass.. The tender, flavoursome fish with the sweet caramelized onions is just divine and quite simple to make.. Enjoy! Preheat oven to 200C. In a pan, melt some butter and olive oil and cook the onions over medium heat until they are golden. Season with salt and pepper, then lay them out on the base of a baking dish. 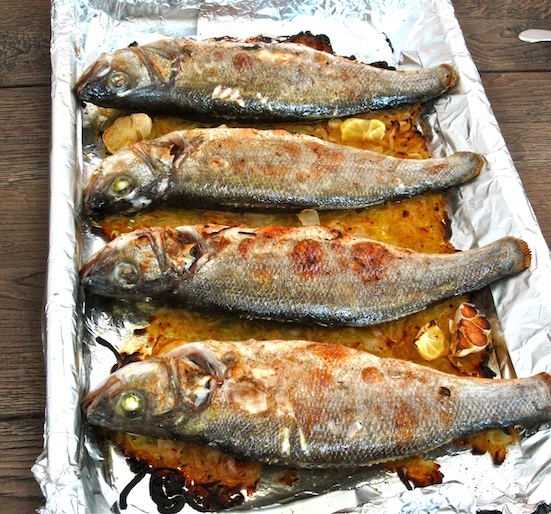 Rub the sea bass with lemon and coarse sea salt (if available), then place the parsley and lemon wedges in the cavity. Brown the fish for just a minute or so in the same pan you cooked the onions in, then place them on top of the onions, drizzle with a generous amount of olive oil and season with salt and pepper. Bake for about 15 minutes, the turn the broiler function on and bake for another 5 minutes or until golden. Bon Appétit! Little Tip: Add thinly sliced potatoes on the bottom of the baking dish before placing the whole thing in the oven - absolutely delicious!